Those Far Out Arrows at Reverb Lounge, April 14, 2017. The last time I saw Those Far Out Arrows they were a trio, with the brothers switching off on drums. 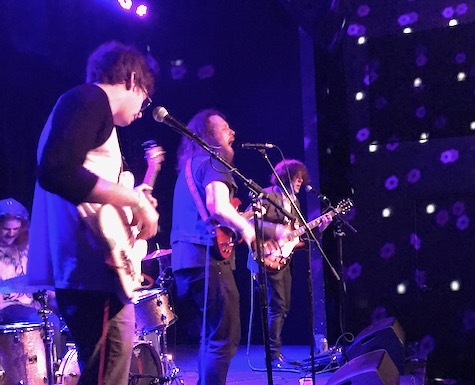 The new four-piece version that played last Friday night at Reverb Lounge, with full-time drummer, was a different band — over-the-top energy crushing psychedelic garage rock that was dense, brutal and trippy. I heard someone in the crowd compare them to the Flaming Groovies, a more colorful comparison than the usual Brian Jonestown Massacre nod. Though there’s a retro tinge to their music, TFOA are thoroughly modern, like the best of today’s Goner-style garage acts, though cleaner and more prof. In fact, less raw. It’s that rawness that defines Goner/In the Red, etc., brittle low-fi garage noise. This is not that. TFOA’s is more refined, which could be seen as a minus in the eyes of some purists. For me, a lot of those low-fi garage/noise acts have substituted rawness for creativity; booming bridled fuzz for a lack of an original sound (or song). By contrast, you can enjoy the Arrows’ music without wondering if you’re missing the gimmick. Like I said, this version sounds nothing like what you might have heard in the past or on their previous recordings, which could be rather droney/dour sailing. All the more reason why they need to get their new 7-inch pressed and out for the world to hear. Classic ’90s indie band Redd Kross (who remembers the single “Annie’s Gone”?) is back and playing tonight at Slowdown Jr.. The band disappeared for a long time, then reemerged in 2006 and put out LP Researching the Blues in 2012 on Merge Records. Vegetable Deluxe opens this 8 p.m. show. $15.